If you’d like to do custom knitted beanies and scarves of your own, then you’re almost there! All you need to do is come to AMBRO Manufacturing because we have the services you’re looking for. AMBRO Manufacturing is a contract apparel customization company with over 30 years in business which means we’ve had plenty of time to hone our craft as well as establish the setups for many different services in one location. You don’t need to be an industry pro to start working with us so you should come see what kind of custom knitted beanies and scarves you can create! Here at AMBRO Manufacturing we handle all of our production in house and we even have our very own knitting machines. 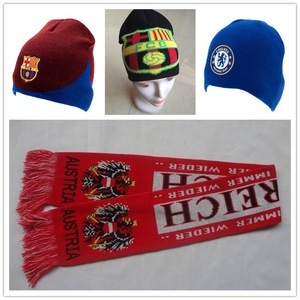 We can create your beanies and scarves right from the colored yarns all the way to the finished product. Since we control the production environment we can offer you modifications to the base product itself like adding cuffs or pom poms to beanies and adding multicolor fringes for scarves. Since the designs are knit-in to the beanies and scarves you’ll never have to worry about your image peeling, cracking, or falling off. If you’ve never tried making custom knitted beanies and scarves before, don’t worry because we can guide you through the process and answer any questions you might have. It’s easier than you think and you don’t even have to leave your house to get it done because we can coordinate the entire order over the phone or through the internet,. So if you are interested in getting started with us today, or if you would like to learn more about our company and all of the customization services we have to offer, you can contact us by email or by giving us a call at (908) 806-8337.